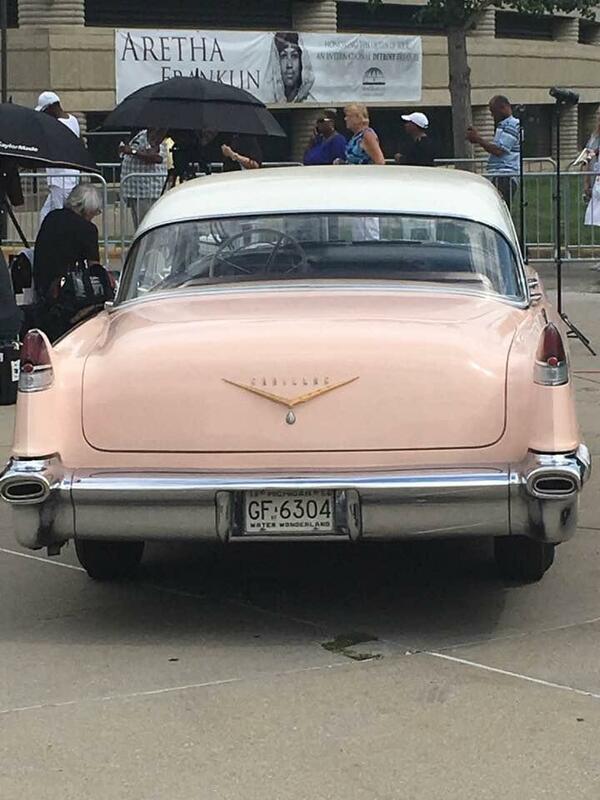 Detroit’s Charles H. Wright Museum of African-American History began a two-day memorial and public viewing for Aretha Franklin Tuesday morning, and thousands from around the country are coming to pay last respects to Detroit’s own Queen of Soul. 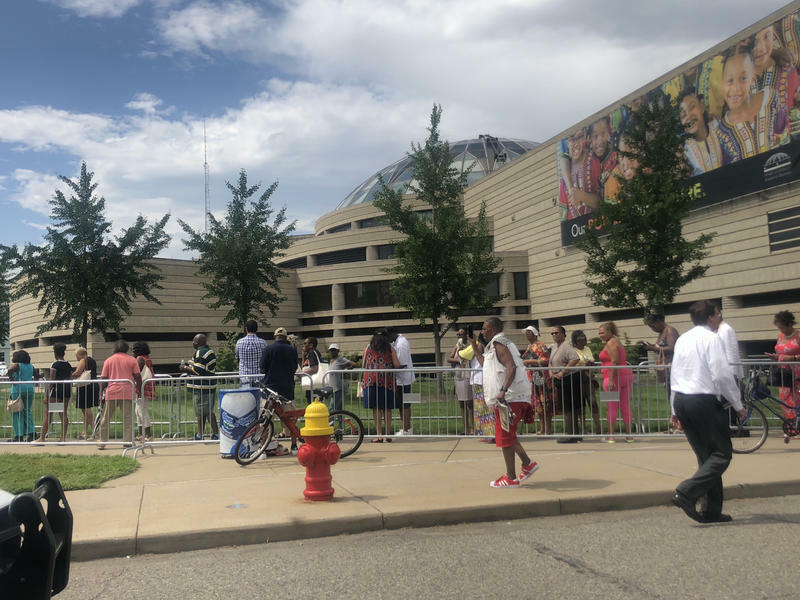 Crowds line up outside the Wright Museum for Aretha Franklin's public viewing and memorial on Tuesday. The mood of the crowd lined up outside the Wright Museum in the early afternoon was upbeat, even joyous. With Franklin hits like “Rock Steady” providing the background, Yolanda Jack sang along, danced, and swapped memories with friends as she passed out free water. “So many songs just make you move, and make you feel like you’re a part of a whole community,” Jack said. “Because as soon as they hear the song, they come singing with you, their favorite part…it’s just one of those things. Aretha Franklin would bring the whole group together, like she did. Denise Ford remembered when her father heard her singing Franklin’s hit “Dr. Feelgood,” and bought it for her from the corner record store. She still has the album today. 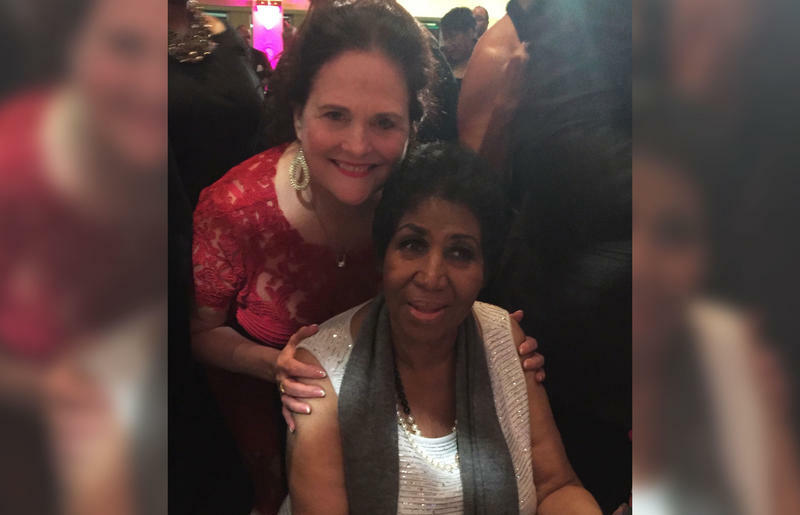 “And my mother, whatever record she had of Aretha Franklin’s playing, that’s the mood my mother would be in,” Ford said. “If you heard ‘Rock Steady,’ my mother would be in a good mood, I’d be in a good mood. But you hear “Respect,” that means for the man to get out of here. You could always tell the mood of the person by Aretha music. People from all over the country also came to pay their respects, including Darryl Coleman of North Carolina. Shaakirrah Sanders called Franklin a personal inspiration. “As a young black woman growing up in Detroit, I don’t know if I would’ve thought I could become a law professor in Boise, Idaho,” said Sanders, growing emotional as she spoke. A pink Cadillac, nod to a lyric from Franklin's hit "Freeway of Love," outside the Wright Museum. Inside the museum’s rotunda, the much quieter atmosphere was infused with the sound of Franklin’s gospel recordings, a reflection of her musical roots in her father Rev. C.L. Franklin’s New Bethel Baptist Church. The crowd filed past Franklin’s gold-plated casket, where she lay in a floor-length ruby red dress, floral arrangements from family and friends. Franklin lie in honor at the museum through 9 p.m. Wednesday. The tributes will continue Thursday, when a memorial concert will take place at Detroit’s Chene Park. Tickets for the event sold out in minutes. Franklin’s funeral follows Friday at Detroit’s Greater Grace Temple. It’s invitation-only, but will be broadcast on local Detroit TV. Invited guests include childhood friend Smokey Robinson, Stevie Wonder, and other musicians, along with former Presidents Bill Clinton, George W. Bush, and Barack Obama. Franklin will then be laid to rest alongside her father, two sisters and brother at Detroit’s Woodlawn Cemetery. 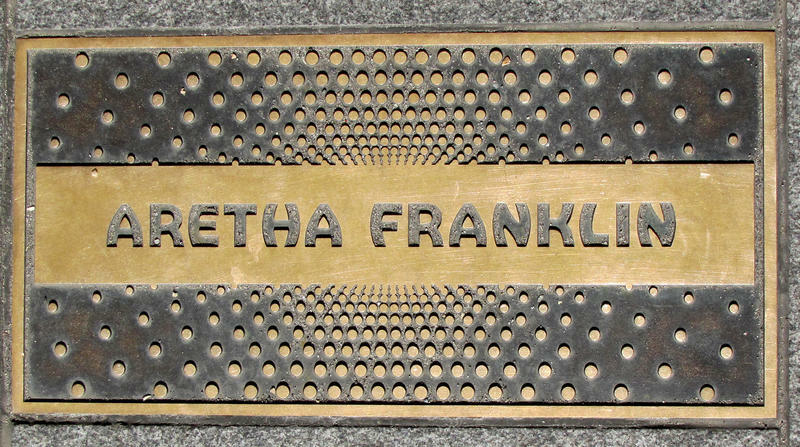 Franklin died of pancreatic cancer at her Detroit home on Aug. 16. She was 76. What would it take to turn Detroit into Aretha Franklin’s Graceland? 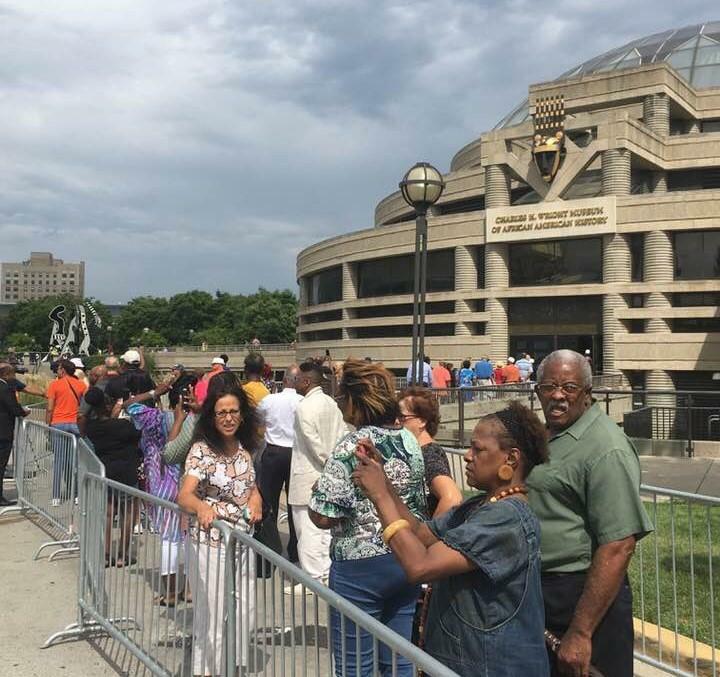 Outside the Charles H. Wright Museum of African American History today, hundreds of people lined up to bid their final farewell to Aretha Franklin. The public visitation is part of a week of mourning and will take place Tuesday and Wednesday at the Wright Museum, with thousands expected to be in attendance.